These are outside of my family and friends, because you know I'm reading your stuff! 1. thepioneerwoman.com - she has some amazing recipes and has a great sense of humor and great giveaways! 2. j-a-girl.blogspot.com - I love her projects and decorating ideas. 3. yourhomebasedmom.com - she's got cool mom status. Great recipes, I made several at Christmas time and I love her decorating/crafts. She also has some great things she does for her kids (3 in college) that I would love to do when my girls are older. 4. orgjunkie.com - organizing inspiration. Check it out on Monday's when it's "Menu Plan Mondays". Lots of recipes and meal plan ideas. 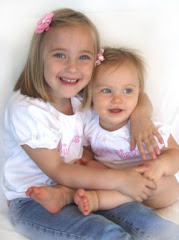 5. luckymecraftsandkids.blogspot.com - she has great craft ideas and fun things to do with young kids.